Tape Label Studio 1.0 is now available! Today (July, 1 2014) Tape Label Studio 1.0 has been released and is available for download at www.tapelabelstudio.com. Easily create customizable and cheap Tape Barcode Labels for LTO, Worm, etc. LTO Barcode Label Generator is now Tape Label Studio! 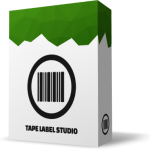 Tape Label Studio is the next generation tape label creation product replacing LTO Barcode Label Generator. See the feature list below or visit www.tapelabelstudio.com for more information, screenshots, downloads or to order your license today.